Olga da Polga has left the pet shop to start a new life with her owners. Her home is now a large and airy hutch and it’s not long before she meets Noel the cat, Fangio the hedgehog, and Graham the tortoise. Her garden companions soon discover that Olga loves an audience and from the moment she arrives she tells them stories about her wild and exciting adventures. Although they are not always sure whether to believe everything Olga says, one thing is certain – since Olga moved in, life is never dull! 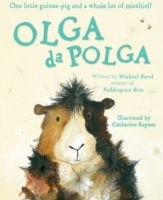 Whether she’s Olga the explorer, Olga the prizewinner, or Olga the storyteller, she is always Olga da Polga! Written by the beloved Michael Bond, with wonderful colour illustrations by Catherine Rayner and a dazzling design, this is a gift edition for young readers to treasure.